Home News Birk Manufacturing to Exhibit at 2018 MD&M West Expo! Birk Manufacturing, a market leader in innovative thermal solutions, will showcase its products and expertise at the 2018 MD&M West Conference. The event will be held at Anaheim Convention Center, Anaheim, CA from February 6-8, 2018. Birk Manufacturing will host its exhibits and customers at booth # 2856. 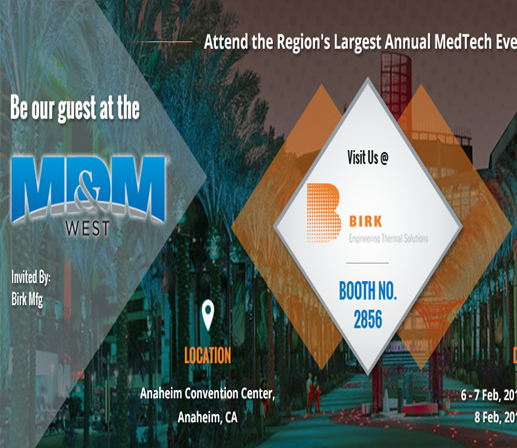 Norman Birk, CEO of Birk Manufacturing said, “We are looking forward to MD&M West Conference because it provides us a platform to showcase our capabilities, products, and domain expertise to professionals from medical device industry. The team takes pride in its innovative thermal heating solutions, and is eager to help the next-generation businesses to take advantage of them.” Birk Manufacturing is gearing up for a product showcase featuring all its signature heating elements and thermal systems. Over the years, its products like heaters, temperature sensors, and RAPT°R heated tube lines, have become benchmarks in highly critical, no fail medical device applications. MD & M West Conference is the world’s largest annual MedTech (Medical Design and Manufacturing) event. This conference attracts 2000+ suppliers, 20,000+ industry professionals, and 150+ speakers from across the globe. The conference provides in-depth insights on existing and upcoming technological trends and patterns of medical device development. The 2018 event will include various educational sessions, interactive case studies, hands-on workshops, as well as immense networking opportunities. Birk Manufacturing, a privately owned company, has provided customized flexible thermal solutions, since 1989. Its solutions are used in a variety of industries including the defense, semiconductor, food and beverages, and various commercial applications. The main product offerings of the company are silicone rubber and Kapton® heating assemblies. Headquartered in East Lyme, CT, the company provides engineering and manufacturing services for all its products. Birk Manufacturing currently holds ISO 9001: 2008, UL, AS9100C, CSA, ITAR, and ISO 13485:2003 certifications. For more information, please visit the website at www.birkmfg.com.